In human anatomy, the acromion (from Greek: akros, "highest", ōmos, "shoulder", plural: acromia) is a bony process on the scapula (shoulder blade). Together with the coracoid process it extends laterally over the shoulder joint. The acromion is a continuation of the scapular spine, and hooks over anteriorly. It articulates with the clavicle (collar bone) to form the acromioclavicular joint. Left scapula. Posterior view. 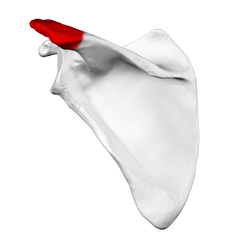 Acromion shown in red. The acromion forms the summit of the shoulder, and is a large, somewhat triangular or oblong process, flattened from behind forward, projecting at first lateralward, and then curving forward and upward, so as to overhang the glenoid cavity. Its superior surface, directed upward, backward, and lateralward, is convex, rough, and gives attachment to some fibers of the deltoideus, and in the rest of its extent is subcutaneous. Its inferior surface is smooth and concave. Its lateral border is thick and irregular, and presents three or four tubercles for the tendinous origins of the deltoid. Its medial border, shorter than the lateral, is concave, gives attachment to a portion of the trapezius, and presents about its center a small oval surface for articulation with the acromial end of the clavicle. The acromion has four ossification centers called (from tip to base) pre-acromion, meso-acromion, meta-acromion, and basi-acromion. In most cases, the first three fuse at 15–18 years, whereas the base part fuses to the scapular spine at 12 years. However, in between 1% and 15% of cases, this osseous union fails and the acromion remains separate as an accessory bone. This condition is referred to as os acromiale, but rarely causes pain. Earlier estimates of its prevalence were as low as 1.4%, and this higher estimate was made by Sammarco in the year 2000, based on radiographic and anatomical studies. This feature was common in skeletons recovered from the Mary Rose shipwreck: it is thought that in those men, much archery practice from childhood on with the mediaeval war bow (which needs a pull three times as strong as the modern standard Olympic bow) pulled at the acromion so much that it prevented bony fusion of the acromion with the scapula. Although historically regarded as an incidental finding, the os acromiale may occasionally produce symptoms from subacromial impingement or instability at the site of non-union. In people with symptoms of os acromiale, dynamic ultrasound sometimes shows hypermobility in the area during shoulder movement, or graded compression with the probe[clarify]. Plan of ossification of the scapula. Posterior side. Acromion visible at upper left, in blue. The acromion process of bats (Mammalia: Chiroptera) is particularly elongated compared to that of humans. Left scapula. Acromion shown in red. Animation. Acromion shown in red. Left scapula. Posterior view. Acromion labeled at top left. Left scapula. Posterior view. Acromion is "10"
Left scapula. Anterior view. Acromion labeled at top right. Left scapula. Anterior view. Acromion is "2"
Left scapula. Lateral view. Acromion is "4"
The left shoulder and acromioclavicular joints, and the proper ligaments of the scapula. Anterior view. ^ Sammarco, VJ (March 2000). "Os acromiale: frequency, anatomy, and clinical implications". J Bone Joint Surg Am. 82 (3): 394–400. PMID 10724231. Retrieved March 2, 2013. ^ Kurtz CA, Humble BJ, Rodosky MW, Sekiya JK. Symptomatic os acromiale. J Am Acad Orthop Surg 2006; 14:12-9. Habermeyer, Peter; Magosch, Petra; Lichtenberg, Sven (2006). Classifications and Scores of the Shoulder. Heidelberg: Springer. ISBN 978-3-540-24350-2. Lee, Michael S. Y. (January 22, 1996). "The Homologies and Early Evolution of the Shoulder Girdle in Turtles". Proc. R. Soc. Lond. B. 263 (1366): 111–117. doi:10.1098/rspb.1996.0018. Rieppel, Olivier; Reisz, Robert R. (1999). "The Origin and Early Evolution of Turtles" (PDF). Annual Review of Ecology and Systematics. 30: 1–22. doi:10.1146/annurev.ecolsys.30.1.1. Warner, Jon J.P.; Beim, Gloria M.; Higgins, Laurence (September 1998). "The Treatment of Symptomatic Os Acromiale". The Journal of Bone and Joint Surgery. 80: 1320–6. Wikimedia Commons has media related to Acromion.